Chad Betts (Guide/0wner), Growing up in Newaygo, I have always felt drawn to the Muskegon River. Since the age of twelve, it has been hard to keep me away from it’s gravel riffles and outstanding fishing! During High School, I worked at a small bait shop in Croton called the Fisherman’s Retreat. It was there I found my calling… Fishing guide. In the Fall of 1996, I founded BGS and attended the University of Michigan for fisheries biology but soon learned I couldn’t stay away. I guided through college breaks and the summers, Graduated with a degree in Fisheries Biology, and a minor in aquatic entomology. For the past 23 years, I have made the commitment to be one of the most knowledgeable float fishing guides on the Muskegon, Pere Marquette and White rivers. I also enjoy fly fishing for Steelhead, Trout, and Salmon. 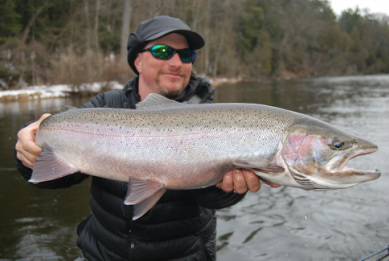 I am passionate about guiding for Steelhead, Trout, Salmon. I currently spend over 300 days a year on the water either guiding, scouting new locations, or fun fishing with my friends. I’ve guided throughout Michigan, Alaska, Colorado, and the Florida Keys. Jake has spent countless hours refining float fishing techniques, designing floats, and custom painting steelhead and trout jigs. 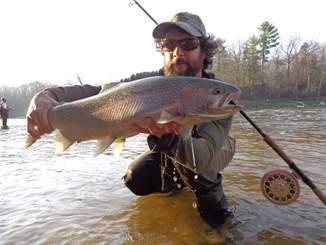 He also has some outstanding spawn recipes for early season salmon and winter steelhead. He has a kind and patient personality, taking time to give instruction and explain how he catches so many fish! Jake is always wiling to share his experiences and knowledge to ensure everyone has a great day on the water! We are very proud to have him on our guide staff. 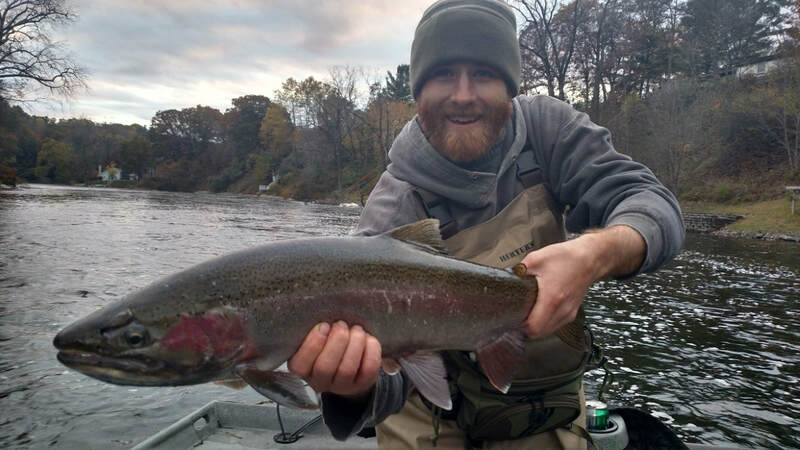 Eric Zerka – Fishing Guide on the Muskegon River for Salmon, Trout, and Steelhead. Eric Zerka, Spent his time cutting his teeth on the Rogue and Grand Rivers. Also spending his time on the Muskegon and Big Manistee Rivers. He began center pinning and learned from one of the best in the Great Lakes region. Eric loves bead fishing and center pinning for Steelhead and Salmon. 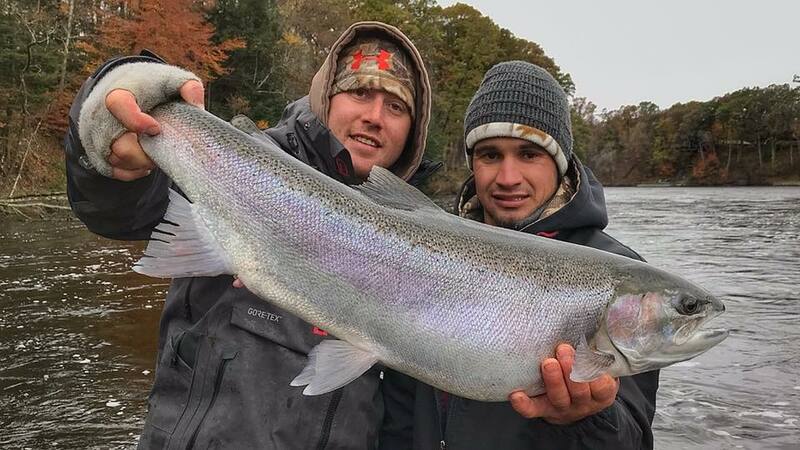 He learned his craft on the Rogue and Grand River but is very much at home on the Muskegon River, Manistee, and Pere Marquette Rivers. He is also an excellent fly fisherman and enjoys swinging flies for fall Steelhead. Eric spends a lot of time developing new steelhead and salmon fly patterns, beads, and jigs. Innovative and patient, he’s always coming up with new ideas. Zack is an excellent fly fishing guide and fly tyer. His passion for guiding salmon and steelhead is unmistakable. He’s a blast to fish with!